For months, I have fretted over the complete lack of snowfall in Innsbruck, Austria, where I am slated to ski for a week with the Jacksonville Ski Club. Indeed, I read a report from the Associated Press a month before the trip begins that Austria is having its warmest winter in 1,300 years! This being my first ski trip to the Austrian Alps, could my timing possibly be any worse? So gloomy do I become that a week before the trip starts, I abandon my daily monitoring of the Innsbruck snow report on the Internet. It is just to depressing to see, for weeks and months, a report of NO snow for the past several days. And to see RAIN and FOG in the forecast. Am I going skiing in the Alps, or in a tropical forest??? Then, a further indignity: On the day of our flight to Austria, our plane is delayed because the northeastern US is being BURIED in deep, frigid snow (we are to fly to DC, where airports are closed due to the weather). It is the biggest snow season in the US in decades, and I’m flying to Europe, where the weather is balmy and snow-less. Our plane lands in Munich – a chilling experience as I think about how this airport was the site, in the 1970s, of Israeli athletes being kidnapped then killed. The Customs agent at the airport sees my home address, and draws a laugh from me when he asks if I have "come to ski in Europe because there is not enough snow in the US." Very funny, I grumble under my breath. The Ski Club is taken by bus from Munich to Innsbruck. 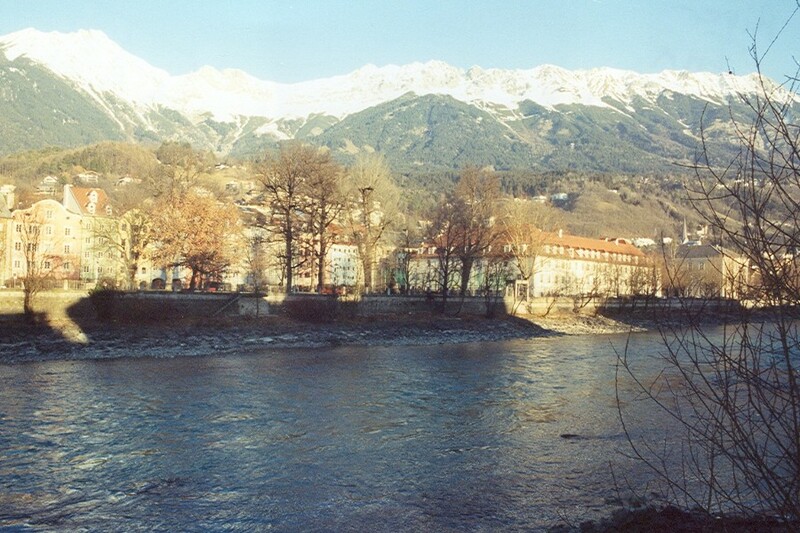 (The word "Innsbruck," by the way, means bridge across the River Inn – the main river in Innsbruck.) Along the way, we stop in the tiny German village of Garmisch-Partenkirchen, a pretty little village known for its lovely buildings adorned by colorful fresco paintings. For lunch, I sample authentic German beer and poached trout. Delicious. Once we have settled into our hotel, I am pleased to learn that the historic quarter of Innsbruck is less than a block from our hotel. 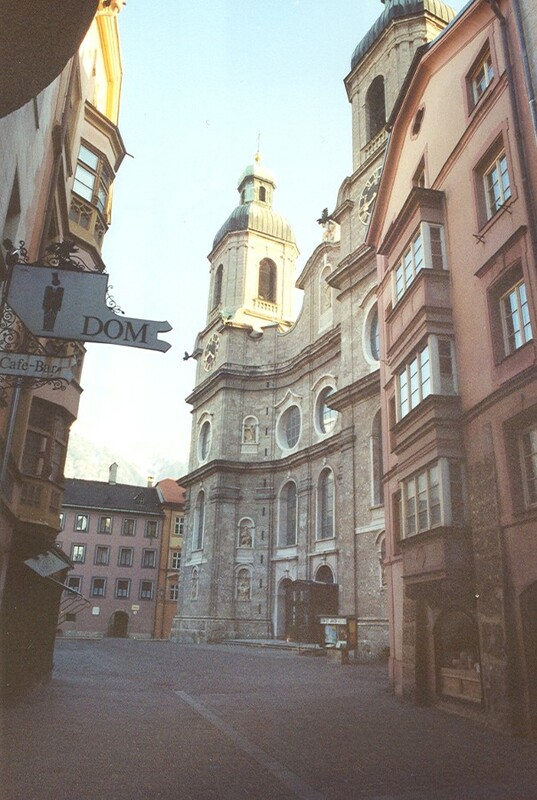 Old-town Innsbruck is highly romantic and pleasingly pedestrian-scaled – a feature I have come to expect in all historic sections of European cities. May these cities retain their irreplaceable history! Dinner that night, as for every night during our stay at the hotel, is a wonderful buffet meal presenting us with a wide variety of Austrian cuisine. I awake the next morning, and board the Ski Club bus for Stubai Glacier, where year-round skiing occurs – even this year, when the winter is the warmest it has been in over a thousand years. On the way, our guide points out two things: First, that the infamous Innsbruck Olympic ski jump is directly in front of us as our bus rolls through the city. Second, that near the bottom of the jump is, appropriately, the town CEMETARY. Of course. We all remember ABC television and how its "Wide World of Sports" showed us the "agony of defeat" as a skier sickeningly summersaults his way down a ski jump after he has crashed. Stubai turns out to have surprisingly good, soft snow (A feature we are pleased to experience all week. Excellent morning snow conditions, followed by afternoons of heavier, wet snow.) The ski area is a bit top-heavy with bunny slopes for "novice" skiers. But the Glacier ski runs are confusing and unpredictable. Some of these "easy" runs seem like intermediate or even advanced in skill level required. And some of the "intermediate" runs are easier than the easiest bunny runs. Other intermediates are more difficult than the advanced runs. Our day ends magnificently on two wonderful intermediate cruiser runs. One of these is a long perimeter trail that starts at the top of the mountain and ends at the bottom, where the parking lot and buses are found. This trail is periodically closed, but we are fortunate because today it is open for "business." And skiing to the buses is so much more enjoyable than taking a chair lift down. The run is narrow, winding, steep and exhilarating. Perhaps most spectacular, though, is the mountain range that lies before us as we ski down the mountain on this glorious trail. Simply, superlatively gorgeous. It is one of the most astounding views of a mountain range I have ever witnessed. The day ends at an Innsbruck dance bar, where I get in a few high-energy dances. This nightclub turns out to be emblematic for Innsbruck, as it becomes clear over the course of the week that Innsbruck is a city vibrant with a fun-loving nightlife. Pubs, clubs and bars are sprinkled throughout its streets. 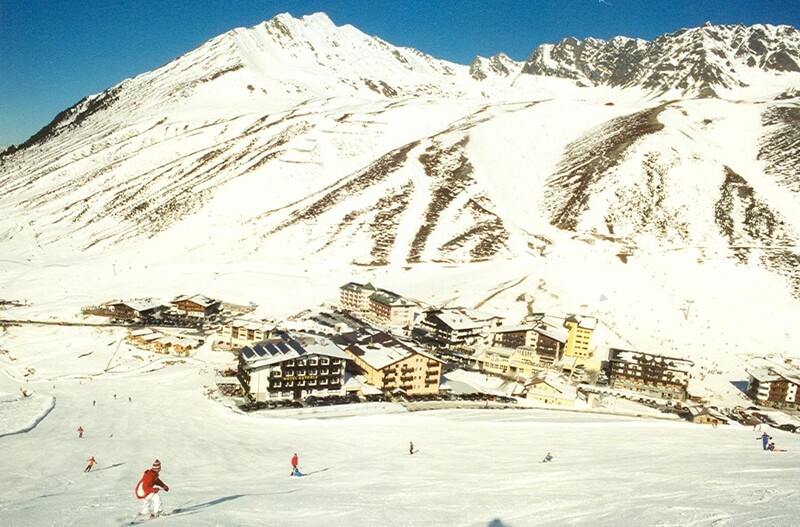 The next day, I am on a bus to Kutai Mountain within the Innsbruck ski area. Again, I find good morning snow and fun slopes. Almost all of the runs here are rated intermediate in skill level, with only one rated advanced. Picture perfect weather again. Unfortunately, Kutai demonstrates a bit of a problem we notice throughout the week: Long lift lines (largely due to the fact that this is the week of the annual Fasching Festival holiday, and the fact that skiers crowd to the few mountains with sufficient snow). That night, the Florida ski clubs parade down the Innsbruck main street, led by an Austrian brass band playing the polka music so well known in this part of the world. The mayor of Innsbruck greets us in the courtyard of the Imperial Palace, where our parade terminates and assembles. There, we are treated to luscious strudel puffs and hot spicy wine. We have been told that Axamer Lizum and Schlick 2000, two other mountains in the Innsbruck range, are both quality mountains with good snow this year. After a veritable coin flip, I decide on Schlick. But a local skier sitting next to me on the bus alerts us that Schlick and Axamer have very mediocre snow. We therefore opt to again ski Stubai, which, fortunately, is the final stop for the bus we are on. We arrive at 10:45 am to find the most enormous lift line I have ever seen in my life at the main lift. There must be over 2,000 skiers in this line. I feel like a teenager waiting to buy tickets for a Rolling Stones concert. It ends up taking us over an hour to get to a chair for the ride up. Finally, after a long series of chair lift rides, we snap into our skis to launch into our first run of the day. As a result, we have time for only three runs this afternoon. Ordinarily, a total of three runs for a full day of skiing would be a disastrous disappointment. But in this case, it is my most enjoyable day of skiing in my days at Innsbruck, for our runs are on a periodically open perimeter trail that we had discovered at the end of the day a few days ago. This run features 20 minutes of thrilling entertainment. The relatively long period of continuous skiing means that the time we spend skiing (even though on only three runs for the day) is maximized, and our time sitting on a chair lift is minimized. The run is a diverse, wild mix of exciting, challenging slopes. 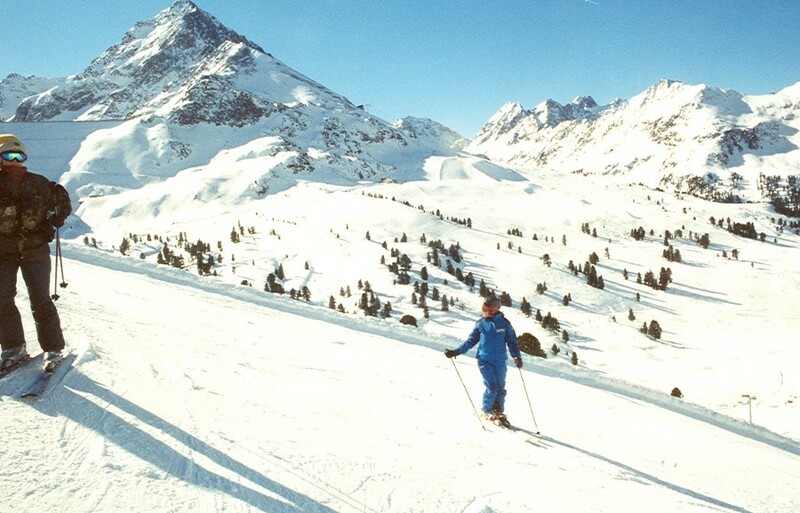 It is the only run that can be skied from the top of Stubai at 3,200 meters, to the bottom of the mountain. The weather, once again, is magnificent. That night, I am in my glory because I find that at our dinner tonight, we are served my favorite pasta dish: Italian gnocchi’s. With pesto. After dinner, we walk to a large Innsbruck Exhibition Hall, where we enjoy a gala dancing and drinking affair with all of the Florida ski clubs in town this week. Authentic Austrian polka music is played, and we are entertained by a series of traditional Austrian folk dance routines by costumed performers. One group of these performers are dressed as grotesque old ladies, who dance to Austrian accordion music. Costumed characters representing the four climate seasons come out and display their dance traditions. Many of them enter our table area to interact with the audience. I am approached on two different occasions by a costumed character. Each time, the performer gives me a customary slap on my back. Then offers me a swing of schnapps from his stainless steel flask. A day trip to Salzburg (population 140,000) comes the following day. The bus takes us through the Innsbruck valley through farms, silver mines and castles. The mountain ranges here are full of ski runs. Indeed, we are told that each village has its own runs. And the runs are served by village lifts. Along the way, we briefly drive through Bavaria, and Hitler’s infamous "Eagles Nest" quarters are pointed out to us. My week-long quest for locally-brewed beer in Austria is to find dark, heavy Austria beer. Inexplicably, nearly every pub or restaurant I inquire at informs me that they serve no such beer. The trip leader informs me that Austria previously brewed quite a bit of dark beer, but in recent years are brewing much less for fear that such beer contributes to obesity. Not to be deterred, I continue my search. In a Salzburg pub, I learn that while they do not have it on tap, they have Kaiser Malz beer in bottles. The beer is relatively sweet, heavy and delicious. 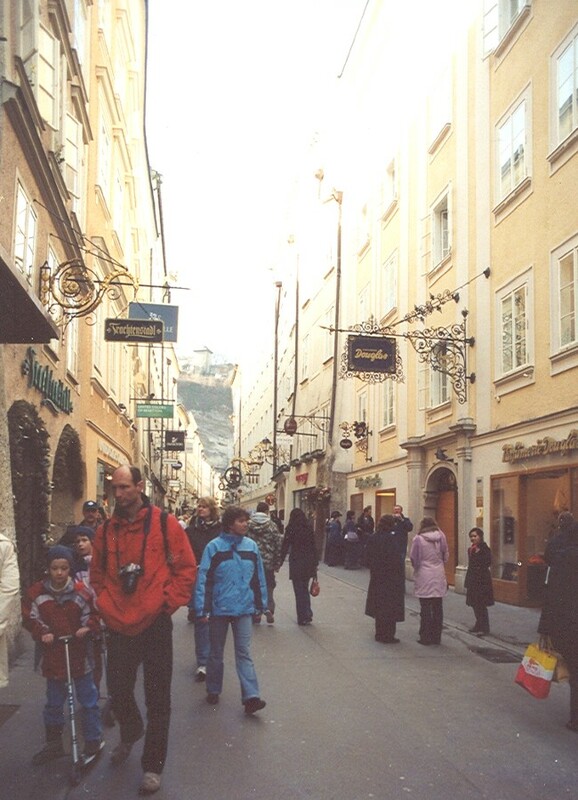 Salzburg is a city of steeples, pilsner and lager (non-dark) beer, and cobblestone streets. On our way back from Salzburg, we stop in the charming little town of Rattenberg. 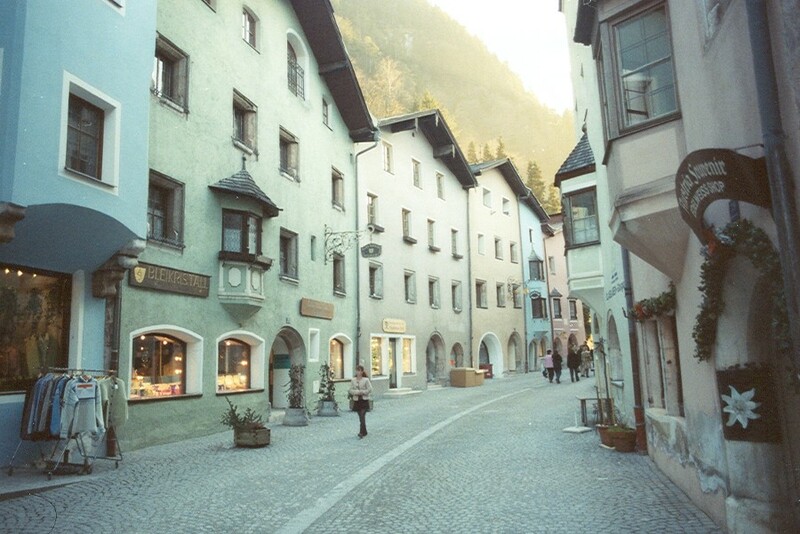 The village is second only to Innsbruck in being a tourist destination in the Tyrol region. It is easy to see why. The town is full of glass and crystal-making shops, trademark cobblestone streets, and delightful architecture. I begin the next morning with a therapeutic swim in the warm hotel pool. My aching ski muscles so need this! The pool is quite interesting, as the water changes color from blue to red to green due to changing lighting within the pool – an interesting visual treat late at night. My destination today is the Innsbruck mountain known as Axamer Lizum, which hosted the 1976 Winter Olympics with the legendary skier Franz Klamer (who I still recall from my childhood days watching the Olympics on TV). The runs here are relatively demanding (which one would expect) as I rocket down the slopes. I try to imagine the slalom flag stations as I ski, wondering how different the runs are now compared to the ’76 Olympics. Did Jean Claude Killey ski here? The runs on Lizum are great fun as I recklessly hurtle down them. Regretfully, however, I find a number of patches of ice or grass, which makes for relatively treacherous conditions. Our lunch is at a restaurant (Hoadl) with an absolutely stunning view of the Alps in all directions from the mountaintop diner. I help myself to an enormous piece of lasagna, Austrian soup, mineral water, a large salad, and Austrian strudel – fuel for the exhausting, exhilarating skiing. Later that night, I fulfill a lifelong dream. As a young boy, my friends and I watched the Winter Olympics. Our fantasy was to mimic the intensity of the bobsled runs. We would watch, wide-eyed, a group of four athletes dashing madly to start their sleds down the ice track, then fly like a bullet along the course. We decided, then and there, that we needed to build a sled run in our front-yard suburban homes in the winter. We ended up, after much back-breaking work, with a run that was about 30 feet long, and learned how it is nearly impossible to build a curve in the course that would have enough of a "lip" so that our little plastic toboggans would not launch off the track (we ended up being unintentionally launched into the snow banks regularly due to our engineering failures). It was therefore to my exquisite joy that here during my Innsbruck trip, I would have an opportunity of a lifetime: Ride a REAL sled on a real life OLYMPIC BOBSLED RUN! Finally, we arrive at the sled run. Five of us climb into a sled with a driver up front. We don helmets, which is particularly satisfying to me as real adventures, in my opinion, all share at least one thing: They are potentially deadly. The track we are to blindingly race down is 800 meters long. The track looks fearsome as its icy surface glows in the high-intensity lighting. The start is a steep drop that requires only a gentle shove by one of the sled run staff. In an instant, we are rocketing seemingly uncontrollably down the course at 70 miles per hour (!!!!). Forty four uniquely exhilarating seconds later, we reach the end. My mouth is wide open in a silent scream the entire wild ride. The track often appears, from the sled, to be a narrow tube, and as I fearfully look wide-eyed ahead, I see steel bars that seem so impossibly low in front of us that I am convinced that we will be decapitated. Adding to the fright is that at 70 mph, the decapitation bar approaches in a blurry instant. Somehow, we shoot under these menacing bars without result. I now know what it is like to be a cannonball being fired out of a cannon. And I terribly regret how brief, yet unforgettable, my bobsled ride has been. My last day in the Austrian Alps is a treat. Our bus takes us to the famed St. Anton ski resort. An enormous mountain with a bewildering number of runs and lifts that would take months to explore fully. Most amusing on this day was to see a dog who apparently "works" at St Anton hop onto a chair lift just in front of us and ride happily to the top of the mountain. I finish this glorious day with a glass of white Austrian wine at après ski near the St Anton main lift at the bottom of the mountain. To put an exclamation point on the trip, I end my Innsbruck stay with a wild night of dancing at the dance bar down the street. First, I find that the Innsbruck ski runs are more demanding than those in the US. Steeper, less well signed. Interestingly, even though Innsbruck ski areas, like other European ski mountains I have been on, provide the challenge of a modest number of tiny ski run signs (which is frowned on in litigation-crazed America), the runs in Innsbruck are astonishingly wide in many cases. Sadly, the snow this year was WAY below normal for Innsbruck. Since I had such a joyously good time, it scares me to think how much more enjoyable it must be with normal snowfall. The language barrier in Innsbruck is much less of a problem than expected. I was delighted to be able to master "danke shen" to thank those who helped me (and for me to be reasonably polite). The city of Innsbruck, much to my extreme delight and admiration, seems to have nearly a complete absence of emergency vehicle sirens. By stark contrast, I live in a city which over-uses sirens so regularly that my nerves are frayed and I feel like I live in a war zone. I am therefore thoroughly able to appreciate the calm, quiet, sleepy ambience that Innsbruck projects. My hat is off to the Innsbruck leadership.